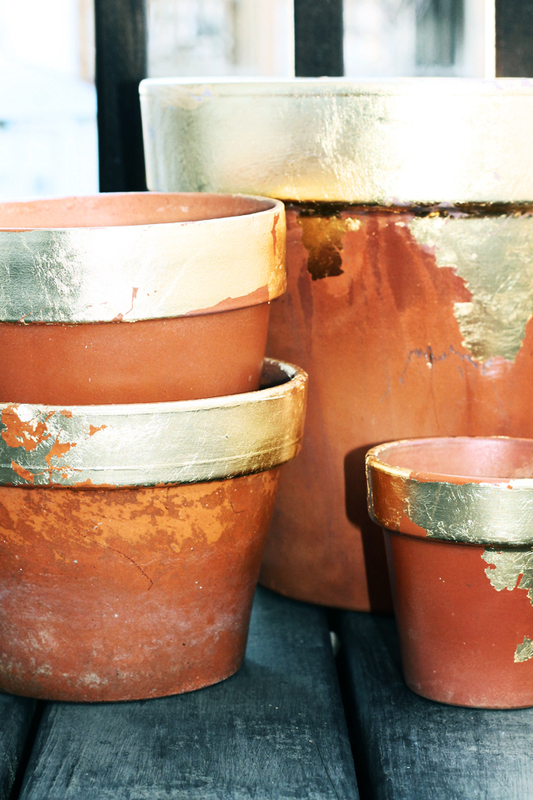 In working through some ideas for our new outdoor space I knew I needed to update some of our terracotta pots. 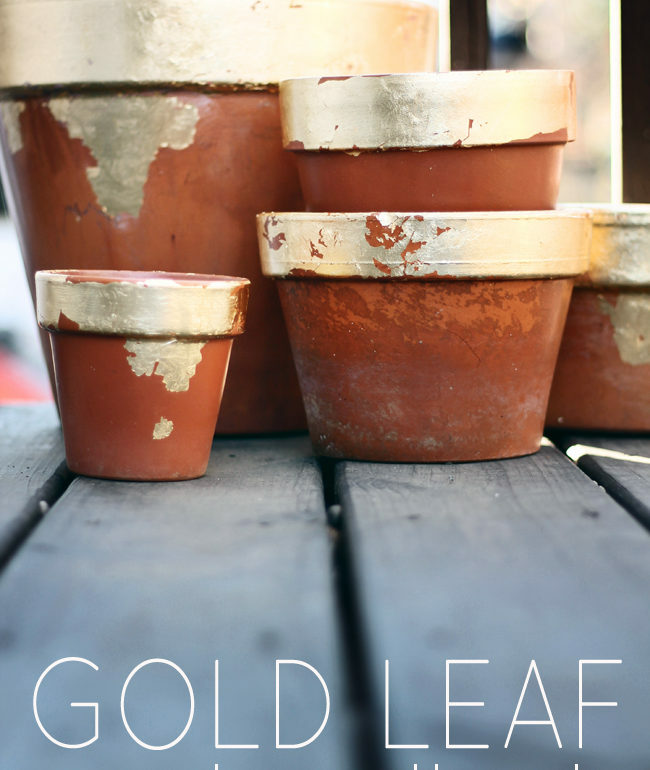 Some are new, some are really old & worn (which I love) so when I saw the image below (found on Gardenista) I knew I could create a cohesive look with all of our random pots. All of the leafing items are all in the same section of the craft store & easy to find. Normally I wold say simply follow the instructions however you will be instantly frustrated as I was. The terracotta pots are so porous they absorb the size immediately completely undermining the instructions to wait 45 minutes for the size to become tacky. It will be dry almost immediately after brushing. So to solve this issue, I would brush a leaf length of glue at a time & immediately adhere the leaf. Simply continue around the entire edge. Until you are complete. Just try not to brush the glue over the existing leaf as it will dull the shine. I kept mine really haphazard fully anticipating some of it to wear off in the elements. I think that will completely add to the unexpected beauty of these, well, beauties. After they were all gilded, I simply coated them in some of the spray sealer. Wanting to retain some of the natural patina on the worn pots, I avoided spraying the bottoms as the sealer will “clean” up the look. I can’t wait to get some plants in these!! All we need is some WARM weather. I am not a cold weather gal. Just sayin. Gold leaf anything makes me melt! Great project, they're gorgeous. Oh, for your future gilding use – try Elmer's adhesive spray. It's better and easier (and cheaper!) to use than Size. What a great look! I can just see them full of bright geraniums! Oh these would be divine with boxwoods or moss balls. Can't wait to see how you style them. Very cool. 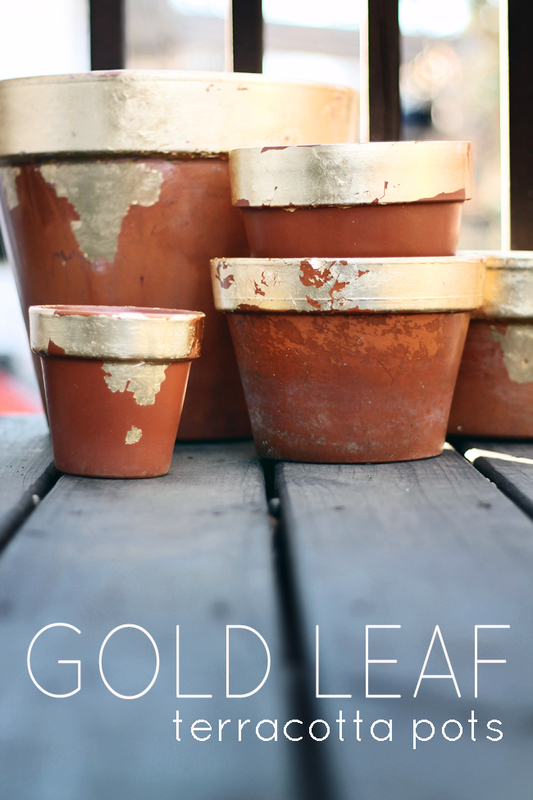 I love the look of gold leaf, but for some reason, I have been scared to try it! Oh I love these. Rustic AND glam. They are going to look great with some green in them. Now I know what to do with all my mis matched terracotta pots! Come on summer! Beautiful! I love anything gold leafed. You have so many great project ideas! These are lovely! I adore the aged/worn look. It is a project that I will have to try. I love working with gold leaf! The mix of shine with the aged pots is perfect! Enjoying Spring Fever here in Northern California. i ve done this on black doors and they look wonderful! i ll try this one too!! 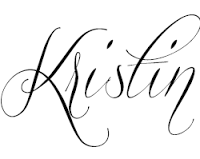 Hi Kristin! I have had these pots on my to do list for my wedding for many months, and I'm now finally getting to work on them. I'm wondering if you ran up against the issue of your brush / fingers getting sticky from the size, thus making it nearly impossible to get a nice, smooth finish. If you wouldn't mind sharing in more details the materials you used for actually laying the leaf down, it would be so appreciated! Thank you!